The ConstantQ™ is a hybrid electrostatic thruster, featuring an exceptionally compact and power-efficient design with a self-neutralizing plasma flow. 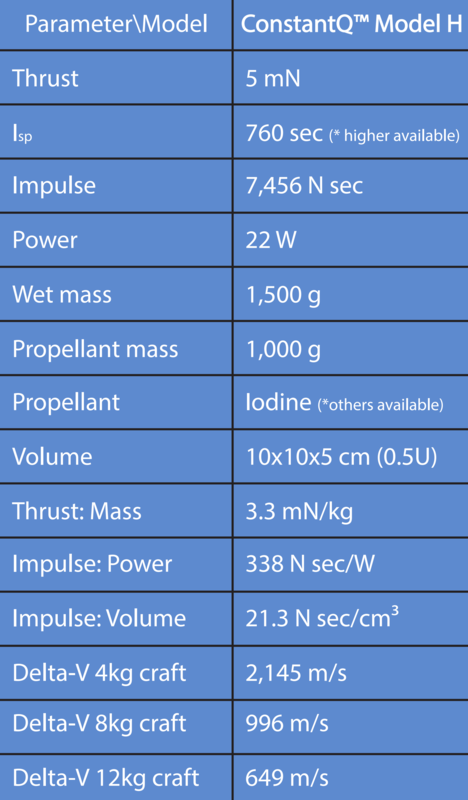 The thruster gives 1.25 mN of thrust (modes up to 2.4mN available), 760 sec Isp (modes over 3,500 sec available), at 5.5 Watts total input power (3W beam power) when tested in Argon. 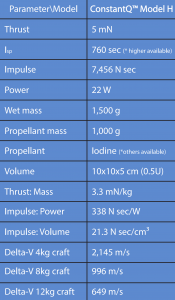 Our “Model H” system includes 4 thruster heads, high voltage electronics, and 1kg of solid Iodine in a 1.5kg total, 0.5U, 22W package, giving a 8kg 6U satellite 995 m/s delta-v. The Model H’s thrusters are canted allowing for both primary propulsion and attitude control without use of moving parts – an important factor in mission assurance. Solid iodine is the propellant, useful for it’s high density, low sublimation energy, and ease of plasma formation. Other high density propellants are being researched as well. The propellant tank is made of nickel and readily resized to fit any mission. Exceptionally compact, our innovative microvalve assembly gives added safety and is tightly integrated to the thruster head, designed for the stringent requirements of the NASA SLS EM-1 mission. The modularity of the thruster head and microvalve assembly lower the cost of customization for novel missions. The engine thrust has been measured in a vacuum chamber using a static thrust stand at Georgia Tech HPEPL. The performance is in line with predictions from Coulomb-force based particle-particle simulations. Thruster geometry and acceleration voltages were varied to successfully demonstrate increased thrust over basic plasma thermal expansion or Lorentz-force based pulsed plasma thruster effects, validating the design principles and scaling factors. 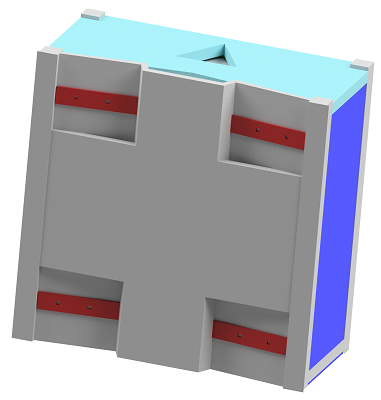 The ConstantQ™ thrusters will be used on the CubeQuest competition’s Miles spacecraft. This craft features 12 thrusters with a custom tank design, taking the craft to lunar orbit and to asteroid 2016 HO3. 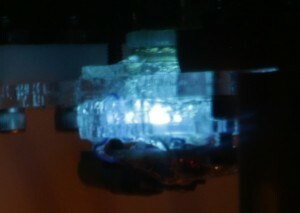 The thrusters create plasma using a spark and pulsed operation, with pulses at several KHz. Plasma is formed near entrances of two electrostatic channels. The channel fields separate the plasma and accelerate the ions and electrons separately. Accelerated electrons leave first, creating a virtual cathode behind the thruster. The remaining plasma is unstable and positive, with a large voltage between it and the virtual cathode. Space-charge mass flow rate is high because of the voltage boost using the virtual cathode. The field geometry naturally neutralizes the plasma without a neutralizer, enhancing lifespan, raising Isp, and reducing total power requirements. Patent information on the thruster can be found at https://www.google.com/patents/US20140305096 Other patents pending.